If you’re new to Storypark, or use it in a basic way but want to learn what else it can offer, this guide is for you. Note: To get the most out of this guide, you should already be part of a service with children and teachers invited. If you haven’t yet done this please follow the Implementation plan to get set up. Our purpose is to help every child fulfil their unique potential, by connecting and empowering the community around them. Storypark is informed and shaped through the guidance of our advisors, international experts and leading practitioners. Storypark has an unusual heritage that shapes the way we think. All of the founding team’s Mums have long careers in early childhood education and continue to guide Storypark’s thinking. 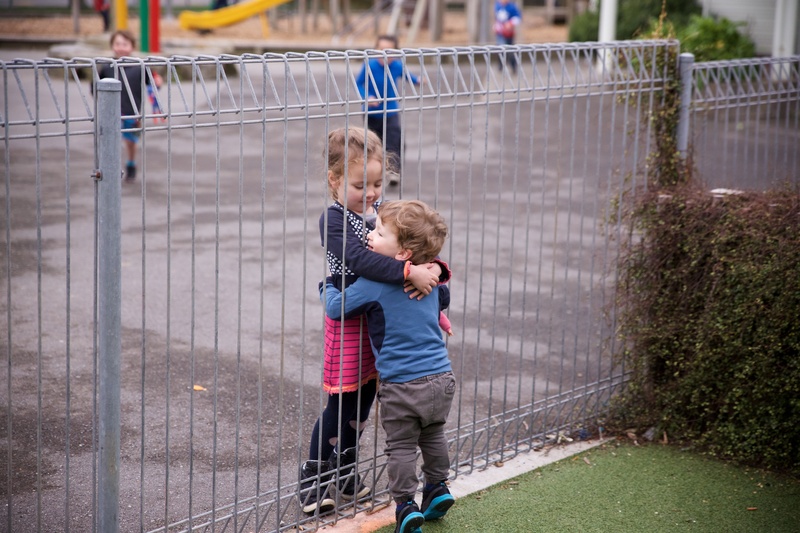 Whereas most portfolio services are centre-centric (only accessible while a child attends a centre), with Storypark parents can access and manage their child’s portfolio, for free, as they develop from birth to school, even after they leave a service. This supports important transitions and a continuous learning journey for each child. Privacy and child safety are core Storypark values. Storypark is password-protected and only a child’s primary guardians can invite family to access their child’s information and stories. We invest heavily in security so your information and communication with families stays safe. Unlike other platforms, Storypark doesn’t own your stories and information, we simply store it for you. If the content was yours to begin with, it remains yours after you put it into Storypark. This helps control each child’s digital footprint. Storypark is the most trusted platform in Australasia and works with most of its leading providers. This means you can be confident we’ll be around for a while and that our security, processes and privacy have been thoroughly tested. What information can different people see? Document, assess and share children’s learning and development over time through learning stories and family updates. Connect your documentation to your curriculum or framework, and see trends over time. Build community and work towards stronger partnerships with parents. Link all your documentation, planning, files and photos in one place to demonstrate and support your planning cycle. Analyse each child’s learning journey and family involvement making it easier to support their unique interests and important transitions. Gather evidence of your own progress for appraisals, teacher registration and professional growth. Through an email notification you receive when something gets posted in your Storypark community. Through the web app via your computer, mobile or tablet’s browser at www.storypark.com. For the best experience, we recommend downloading and using Google Chrome instead of using your device’s default browser. For more tech recommendations, see our Help with technology guide. Through the Teachers app, available to download on iOS and Android. The app is designed to record quick updates when you’re with children and offers a simpler experience to the web app, so not all features are available. Families can download the Families app where they can receive your updates, and create their own moments to share with teachers and other family members. "I would suggest just getting onto Storypark, you can’t break it. Click on the buttons, try something out, and create a draft. Just practice as much as you can. I created a ‘child’ with my name and then wrote stories about my own teaching as a way of practicing what I wanted to write, and to work out how different things looked. If possible, find someone who knows more about Storypark and ask them for some ideas and support. This is ideal if they are only one or two steps in front of your learning because then they are strengthening their knowledge by teaching it to someone else. Every page in the web app has a Need help tab at the bottom right. a way to contact our support team by tapping Ask a Question. For more support and training resources, visit storypark.com/support. get inspired through our blog, Mat Time interviews and Teach Me ideas. “The Storypark help site has excellent workshops and resources to get you started. I’d suggest for centres to make this a part of their new teacher induction process and allow for their first non-contact time to participate in the 'Introduction to Storypark' workshop." Latest activity. What’s been happening in your Storypark community. All the latest stories, posts and comments will show first. Learn about your latest activity. Draft stories. Any stories you’ve created but haven’t yet published. Learn about drafts. Pending stories (will only display if you are an approver of stories). Any stories that have been submitted for approval and are awaiting your approval to check and publish them. Learn about stories pending approval. Your teacher profile. As a teacher, you have your own profile where you can manage your settings, and view your conversations, child stories, and portfolio stories you’ve saved as evidence for your appraisal or teacher registration. You can access other teachers’ profiles by going to your service’s Teachers page, and tapping on that teacher’s name. Learn about inviting teachers and making a teacher an admin. 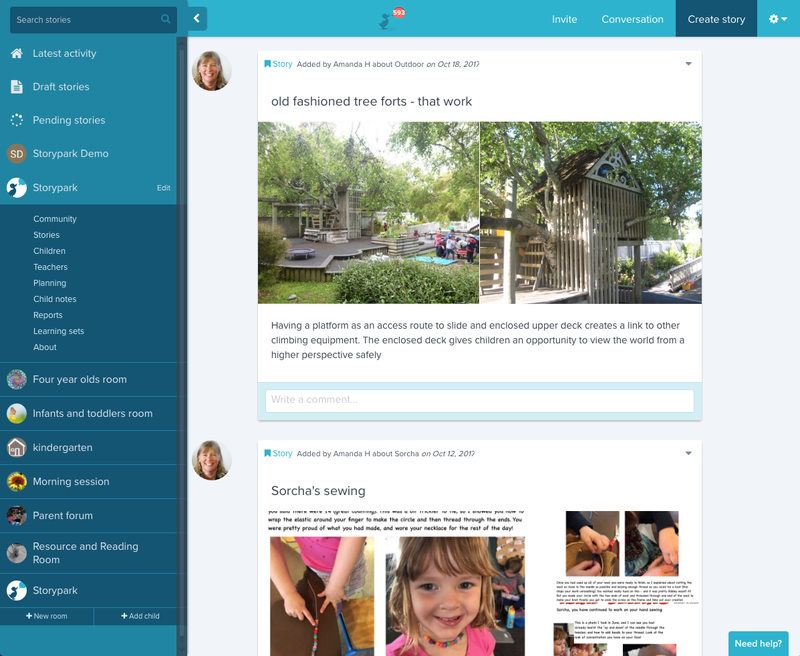 Your own family children’s profiles (only applicable if you use Storypark for your family use). Learn about using Storypark as a family member. Community – Post and view updates that all teachers and family admins can see and contribute to. Stories – All of your service's child stories. 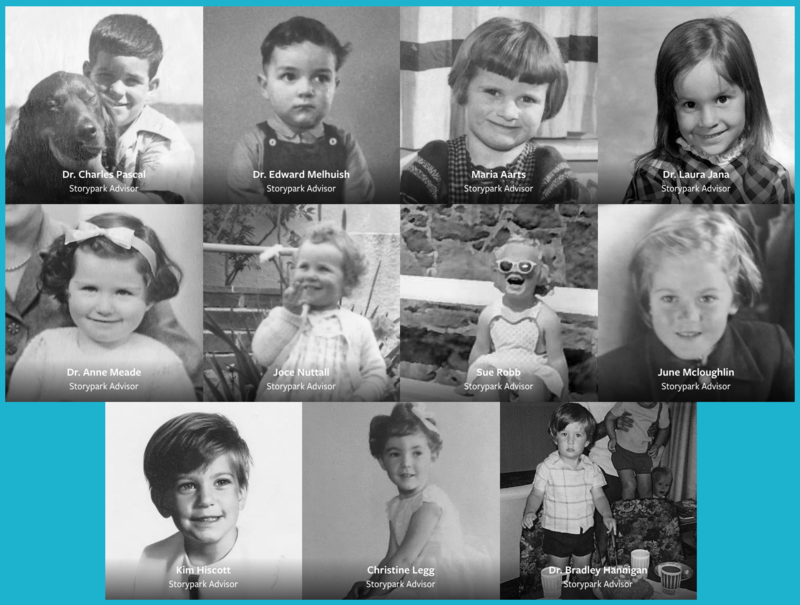 Children – The profiles of all your service’s children. If you hover over any child’s name you’ll see a list of their latest activity. Teachers – The profiles of all your service’s teachers. Planning – All your service’s plans that have been started by you or shared with you. Child notes – All of your service's child notes. 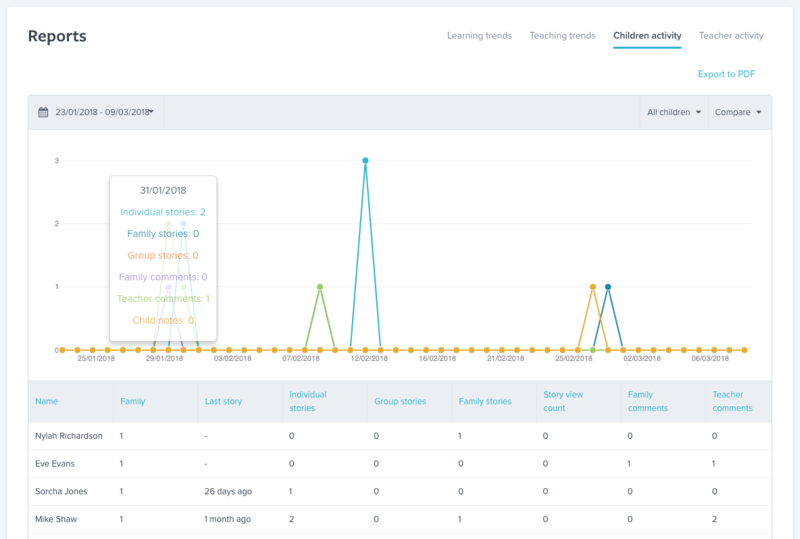 Reports – View and compare your children’s and teacher’s activity and trends. 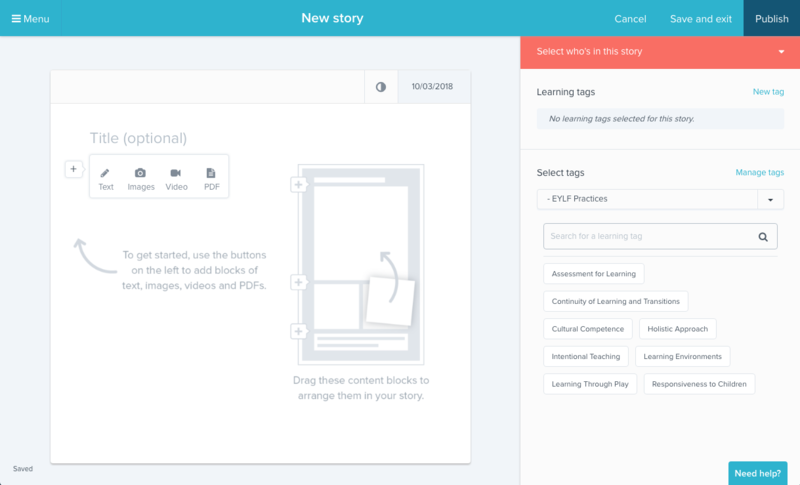 Learning sets – Manage the curriculums and frameworks you wish to tag in your stories. About – An area where you can describe the service you provide to families. for services with more than one group of children. 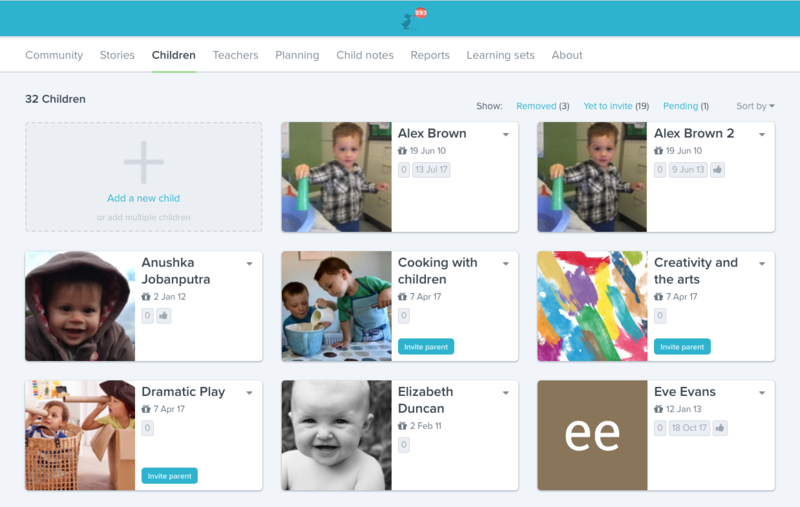 Each child has their own profile page where you can edit their details, view their stories and notes, access any plans they’ve been added to, and see which family members have been invited to their profile. You can also see their birthday and any other services they attend. You can view the family members who have access to each child’s profile. For privacy reasons, teachers can only invite one family admin (usually a parent) to a child’s profile. Once they accept, that person manages the child’s profile and can choose who else is invited to it. The first person they invite would usually be the other parent who they would also make an admin. access and contribute to their child's notes. It's recommended that all parents become admins so that they can jointly manage their child’s profile and be involved in the day-to-day happenings of your service. A message to a child’s immediate learning community (only teachers and family admins; wider family cannot view these). 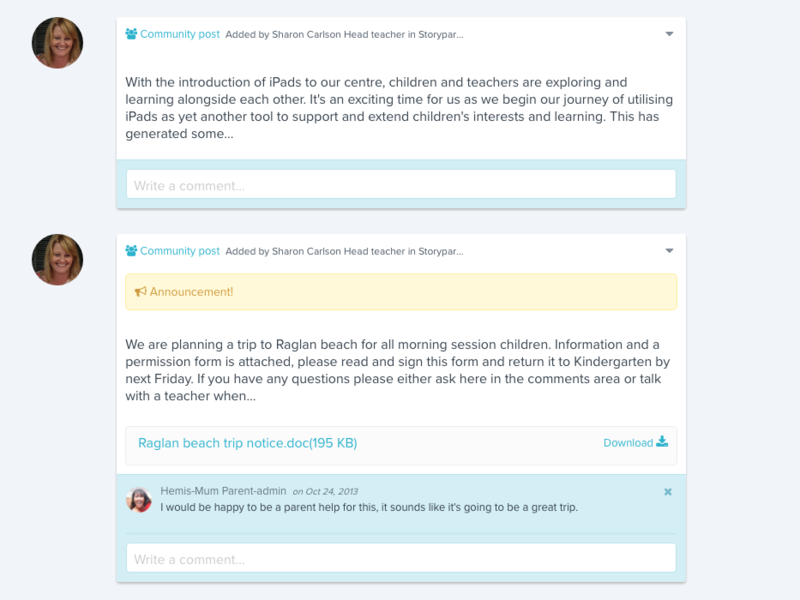 This is a great place to build community and share what's happening to get families involved – notices, reminders, daily/weekly summaries, current interests, ideas of activities to do at home, events, recipes, introducing new staff etc. Families can also create community posts but you can turn this feature off if you wish. Responses on community posts can also be turned off. An email notification gets sent whenever something is posted but families can turn this off if they wish. However if you select the Announcement checkbox an email will be sent regardless of whether they’ve turned this off. We recommend only using announcements for urgent matters like the service needing to close. Only admins have this feature. Private messages between teachers and/or family members within a learning community. Conversations allow teachers and families to talk privately about things without it contributing to the child’s profile or teacher’s portfolio. Private communication between a child's teachers and family admins that show on a child’s profile. Notes can be given a category eg. Goal or Aspiration to allow easy filtering. You could use child notes to ask about a child’s learning at home, let a parent know about an incident, share resources and ideas to support the child, or link together notes and stories so you can show and support a child's progression over time. For tips and strategies on using these features, see our guide on Strengthening family engagement. Stories are a tool that help record and communicate children’s learning with family, early learning services and eventually school, providing greater insight into each child. Services around the world record and communicate children’s stories in vastly different ways. Storypark is built in a flexible way that can incorporate all types of learning and curriculums. A learning story might include examples of a child's strengths, interests, development and knowledge. Images, videos and audio of the experiences add to the richness of the story. 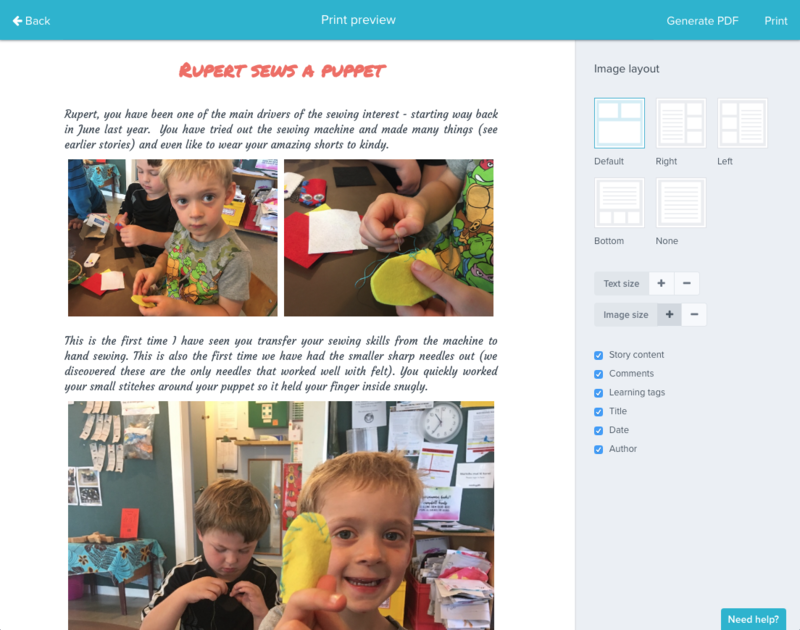 The story editor lets you add children, text, images, PDFs and videos, and make links to your curriculum or learning outcomes with ‘learning tags’. You can save a story as a draft, or publish as an individual or a group story. portfolio/teacher stories to record evidence and reflections for your own teacher portfolio. "When you're just getting started, read other people’s stories and jot down what appeals to you about them. Are they clear and well formatted? Where do they put the photos? Do they ask parents questions? What is the content in the story? Then just practice. Add learning tags so you can find what you wrote easier. E.g. you could create a tag for all your practice stories called ‘practice’ then when you are looking for one, just search for that tag. See our quality practice guides on Taking great photos, videos and notes and Creating rich assessment. 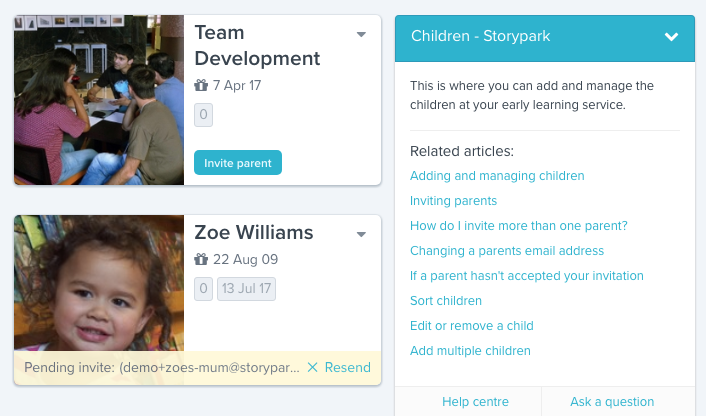 When you create a story about children, everyone who's been invited to those children’s profiles will receive an email be able to view that story. No other people will have access. 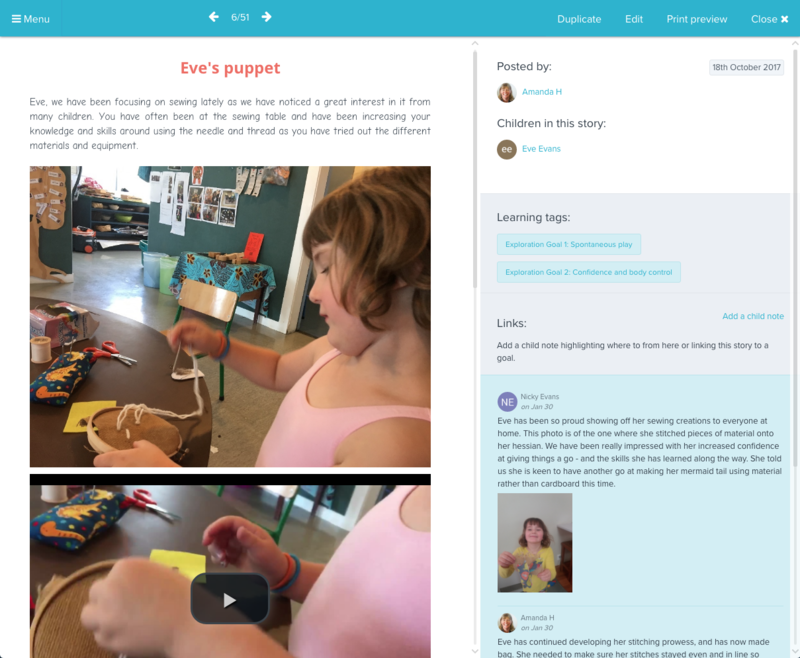 Published stories can be viewed on the profile pages of a child, a teacher, a room and your service. 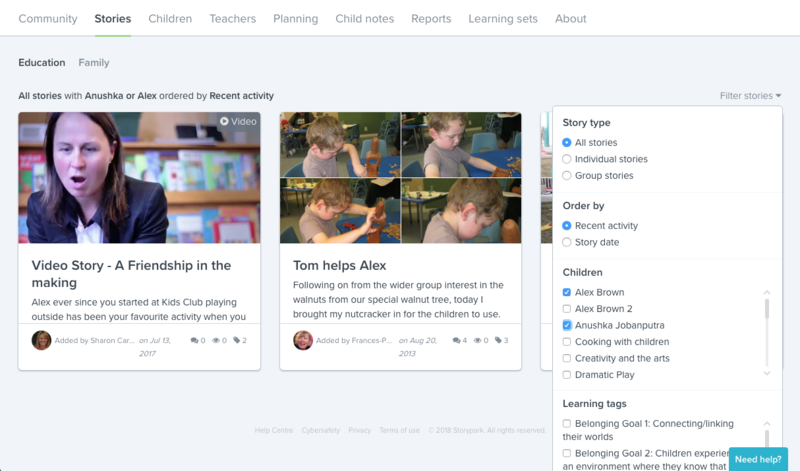 You can use the filter to find or group published stories by story type, child and learning tags. 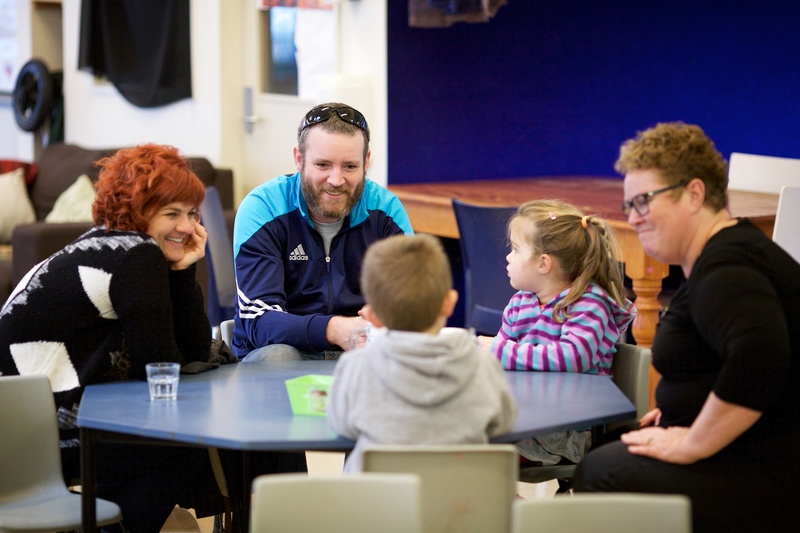 a nana responding to their grandchild’s story with a comparison – "When I was your age..."
a teacher responding to another teacher's story about a child, showing evidence of how the learning was continued or recognised elsewhere in the service. When a parent responds or shares a story, acknowledge this by responding in Storypark or face-to-face. This lets them know you value their contribution, big or small. To encourage family feedback ask a question in the story, e.g. ‘Have you seen this at home?’ or ‘Where did this interest come from?’. For more tips and strategies, see our quality practice guide on Strengthening family engagement. You can print any published story, either for a child’s profile book, a wall display or to keep as evidence. A preview page will open where you can change the size and position of images and text on the page and then print or save as a PDF. We recommend waiting until people have finished responding to the story before printing it so you can include the responses in your printed copy. Learn more about Set up your browser for printing and Printing stories. Activity reports provide insights into activity and trends happening at your service. Learn more about activity reports. Your personal and account settings can be accessed by tapping on the settings cog at the top right of the screen. Account settings – Manage the details of the services plan (Admins only). 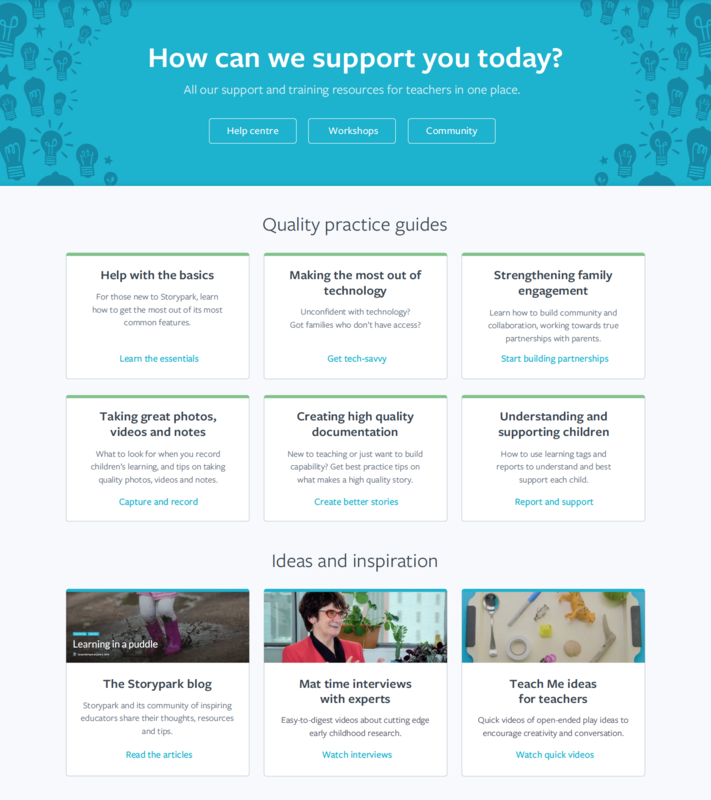 Once you’ve mastered the basics of Storypark, we recommend exploring the planning area, which offers a flexible way to plan across all aspects of your practice – programme/curriculum planning, ‘All about me’ sheets, QIPs, internal evaluations, annual plans, appraisals, transition reports, summative assessments, meeting minutes and more. To learn more, see An introduction to planning. We'll also be covering this in a future quality practice guide. Support and mentor a colleague to help them learn some of these common features.